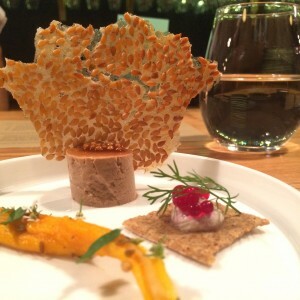 Farm Spirit Vegan Tasting Menu. Gluten-free, of course. 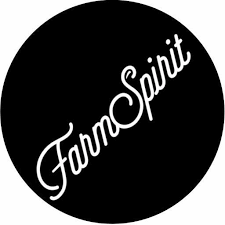 Last night we went for an amazing experience at Farm Spirit in NE PDX. Full review on my blog here. 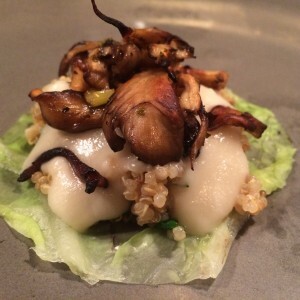 They have a vegan tasting menu that is always low-gluten but not necessarily gluten-free. They were, however, more than happy to accommodate me with a gluten-free meal. When you make a reservation they specifically inquire if you are a gluten-free eater. Once at the meal there were few small changes in the menu that they made for us. But don’t get me wrong, these weren’t just ‘pull out the bread’ kinds of changes but careful and attentive substitution changes. Instead of a bread side we got handmade crackers. Instead of a roll we got an extra dish. 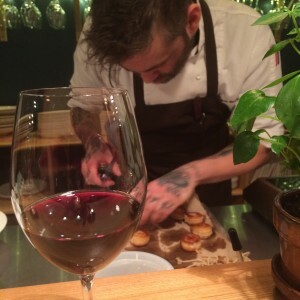 The food was phenomenal and the chefs were clearly doing something they believe in…serving high quality, local, artfully prepared and presented dishes, accommodating the needs and desires of their diners. Brilliant. Here are a few shots. Full review, more details and additional pics over at DrSamantha.com. Restauranteur of the year and native Oregonian Ed Casey is bringing Vegan restaurant Veggie Grill to town! 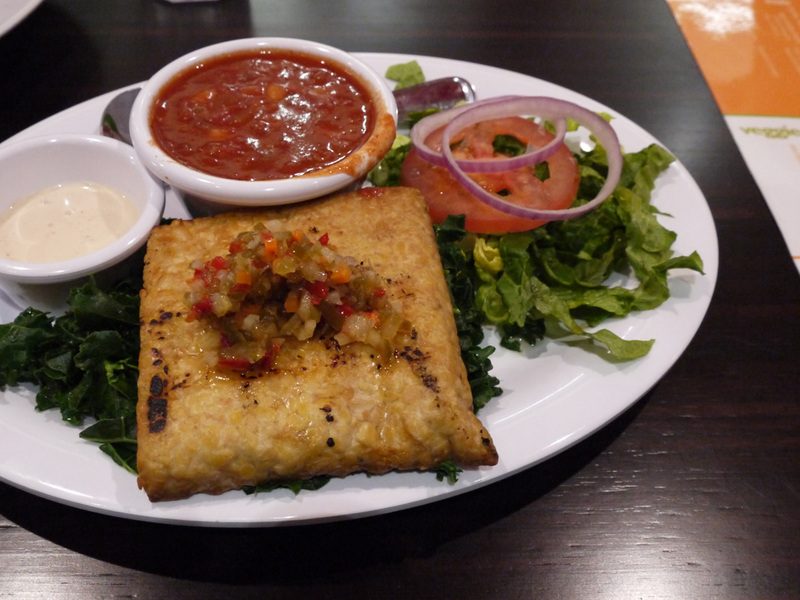 Veggie Grill has hearty comfort food that really brings a new twist to vegan and vegetarian fare. 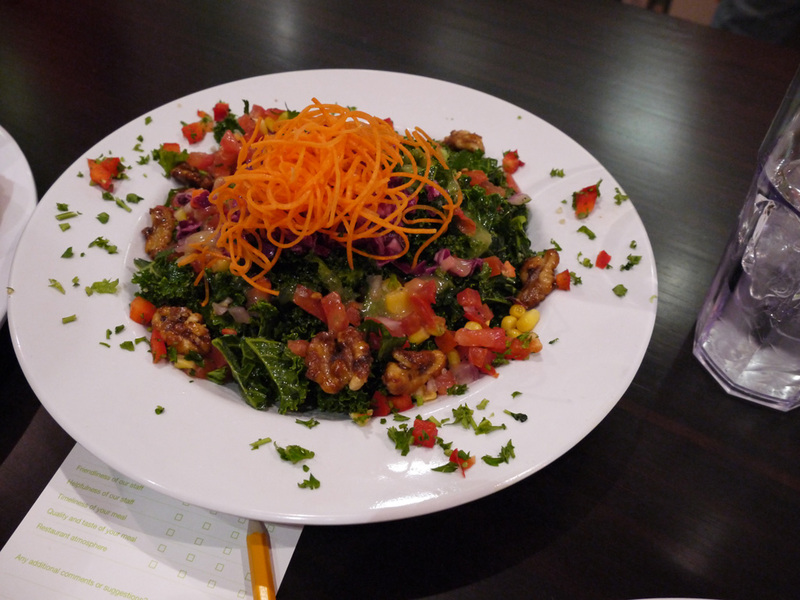 The Veggie Grill menu is satisfying food for vegetarians and vegans and traditionally meat loving folks alike. The restaurant is located at 3435 SW Cedar Hills Blvd Suite D, Beaverton OR 97140. We didn’t know exactly what to expect, but the website makes it look kind of like a more pricey vegan American fast food joint. That is pretty much what we discovered when we attended the event. I also heard it described as “vegan American comfort food” but it’s definitely not “comfort food” in the collard greens & grits sense of the word. So yeah, I’m going to stick with more pricey vegan American fast food joint. They are a chain that started in Los Angeles, and there is one in Seattle as well. Comparisons to Chipotle, Baja Fresh, and/or Noodles & Company would definitely be fair. The place was clean, the help was friendly, and the food arrived very quickly. The decor is slick and the restaurant has an upbeat and energetic vibe. Basically the entire menu is salads and various kinds of veggie burger. And here’s where we introduce the unfortunate fact: we’re not really going to be the core audience for the Veggie Grill. The sandwiches are served on wheat buns and the vegan chickin’ and veggie-steak meat substitutes are made with wheat (among other ingredients). The burgers can be served on a bed of kale, and they do have tempeh, so that opens the options up a little bit, but really, almost everything on the menu needs some fiddling to make it gluten-free. When asked about the gluten-free options, all the staff were able to make suggestions, and it was obvious that the restaurant took the time to educate everybody about gluten issues (which we always really appreciate). The items on the menu that were suggested were the All Hail Kale (pictured above) with tempeh, the Thai Chickin’ salad (but without the chickin’ and wontons), the Bali Bliss Sandwich (but on kale), and the Papa’s Portobello burger (also on kale). We sampled the All Hail Kale, Bali Bliss on kale, and the Portobello burger. We both quite enjoyed the All Hail Kale, which is basically a marinated kale salad with cabbage, salsa, and a vinaigrette. It was fresh, light, and flavorful. The veggies were obviously fresh, and the dish was satisfying. Sienna found the Portobello burger disappointingly bland. The Bali Bliss was basically as good as a tempeh patty can be when served on a bed of kale. I like tempeh, and if you’ve had a lot of tempeh, then you probably know what I mean. The tempeh itself was good but not particularly flavorful. It was served with an interesting lightly spicy aoli-like sauce, which helped quite a bit. The final analysis: We both left with the feeling that we weren’t really the intended audience of the Veggie Grill. Although they’ve definitely done their homework to be gluten-free friendly, the menu isn’t marked, and I think that there’s enough room for ingredient confusion with fakin’ chicken and beef that it probably should be marked. I will say that if we lived in Beaverton and some of our vegan friends wanted to get something to eat, it would be on our list of possible places to visit. Check out Portland vegan blog Get Sconed for more coverage. Great news everybody! Our favorite Cuban restaurant, Pambiche on NE Glisan, is now gluten-free friendly, sporting an “alternativas” menu (PDF here). I’m not going to go into a great deal of depth with this article. Suffice it to say that they have a number of items on their regular menu which are also gluten free. All of their fritters are gluten-free, as are their fried plaintains, yuca root, salads, entrees, and even a couple of desserts. 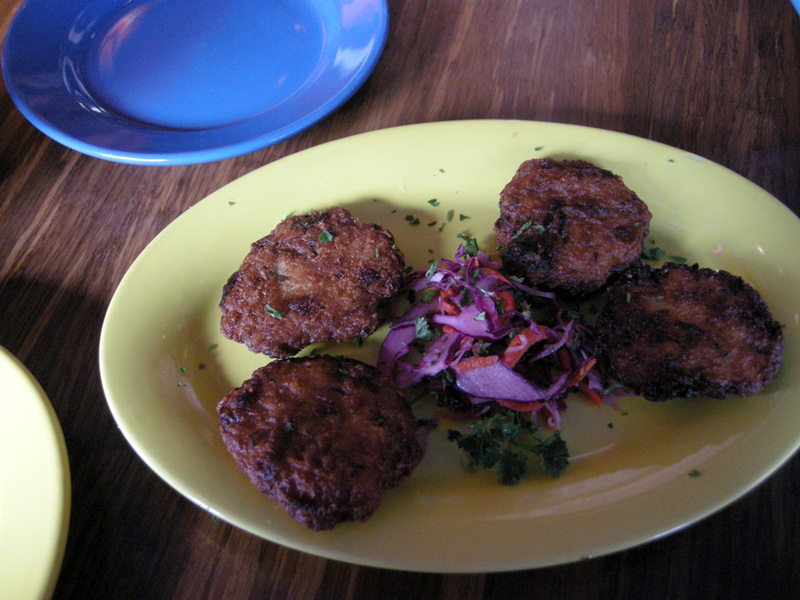 Here’s what I got for an entree when we visited: The Camarones al Ajillo. These are delicious garlicky prawns with a sour orange sauce served with white rice, pan frito, and ensalada de aguacate. The wait staff at Pambiche is always really awesome, the food comes out in a reasonable amount of time, and there is always a ton of stuff on the walls to keep a person’s attention. My only real complaint with the place is that it is too small. They really need to get a larger dining area. There always seem to be people waiting for seating every time we drive by. I have to say that I’m amazed and excited with how many restaurants in Portland are starting to get hip to the gluten free jive. Did I mention that the alternative menu also has some vegetarian and vegan options? Good deal. If you haven’t been to a cooking class at Bob’s Red Mill, the format is less participatory and more like watching someone cook while they give you tips on how to be successful with the dishes. Everyone is given a handout with recipes for the dishes being prepared. 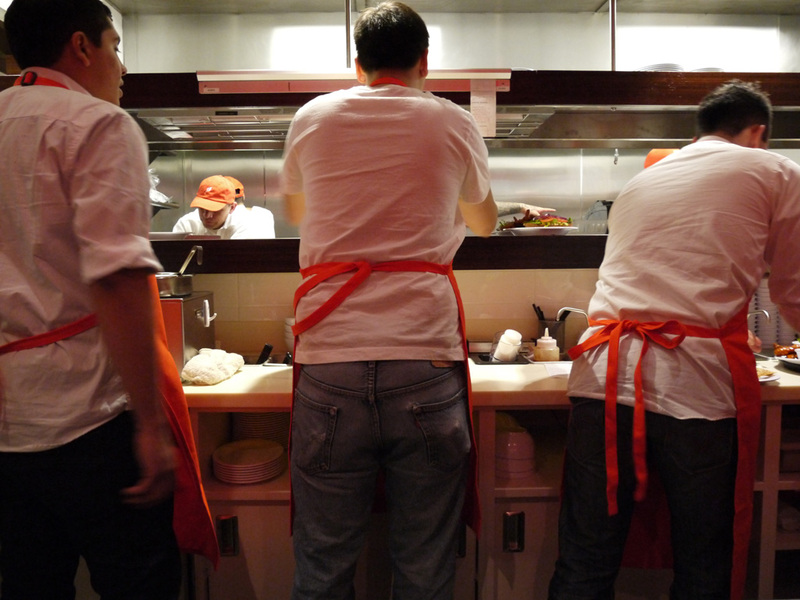 At the front of the class there is a large island with burners and cutting boards, where the cook does their work. On either side of the island, hanging from the ceiling, are two monitors which show a view from above the cooking area, so that you can see what’s going on inside the pots while the food is being prepared. As the dishes are finished, samples are handed around to everyone in the class. Also, audience members are encouraged to ask questions, and the crowd this night was very inquisitive. 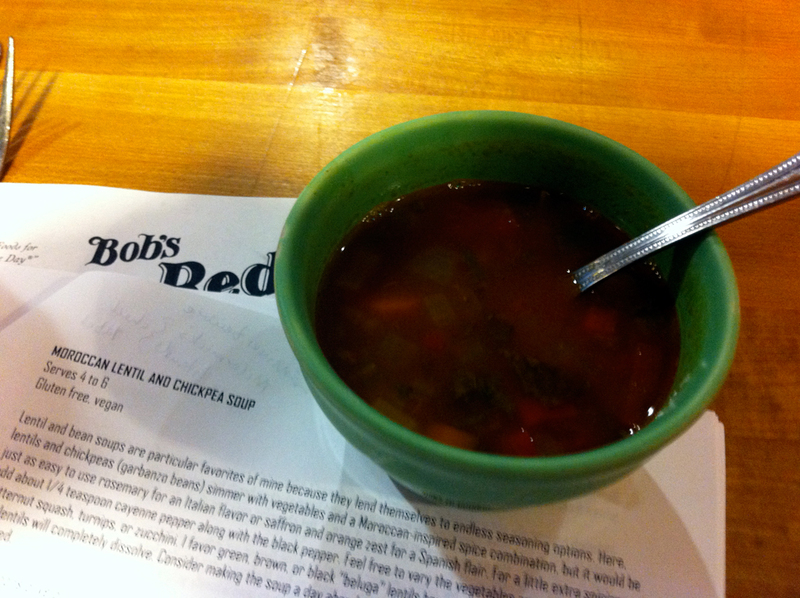 We recently attended the aforementioned gluten-free soups class at Bob’s Red Mill. The class was taught by Laura B. Russell, the author of The Gluten-Free Asian Kitchen , which we are currently working our way through. The other upcoming gluten-free class happening there is a desserts class with Crave Bake Shop’s Kyra Busanich (see here for details). More information about Laura B. Russell is available at her website, www.laurabrussell.com. She also writes a monthly column for the Oregonian’s Food Day section called “Gluten Freedom” (click here for a list of previous columns), and is also a contributor to Portland’s MIX magazine and to Easy Eats and Living Without magazine. The dishes included in the handout were: Moroccan Lentil and Chickpea Soup, Creamy Curried Millet and Vegetable Soup, Brazilian Cheese Puffs, Eastern-European Style Mushroom and Buckwheat Soup, Wild Rice Soup with Smoked Sausage, and Peruvian Quinoa Chowder. We got samples of the first four of these dishes, and they were all really delicious. The Moroccan Lentil and Chickpea Soup was my favorite. It’s got an amazing ginger, cumin, and cinnamon spice blend, and features fresh mint added at the end. The recipe for this dish can be found here at Russell’s website. This recipe happens to be vegan. A bunch of the recipes on her site are vegan/vegetarian friendly. 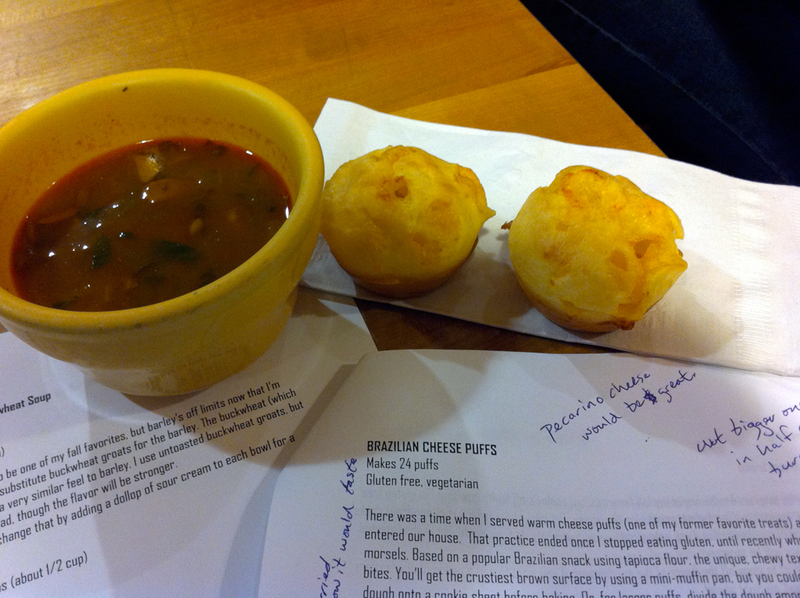 The items that prompted the most questions and discussion were the Brazilian Cheese Puffs. Fortunately, the recipe for this dish is also available at her website, here: Brazilian Cheese Puffs. Russell noted that a person could make larger sized puffs and use them for hamburger buns, or make smaller sized puffs and then stuff them to create hors d’oeuvres. She also noted that the most important ingredients are the tapioca flour, the milk, and the eggs. So a person could change up the cheeses used, and also try different milk substitutes. During the break we went up and introduced ourselves. We had some questions about a recipe that we had tried out of the Gluten Free Asian Kitchen book. Russell was very friendly and was happy to have a long discussion about cooking dumplings with us. After the class, she was available for more questions and also to sign copies of her book. 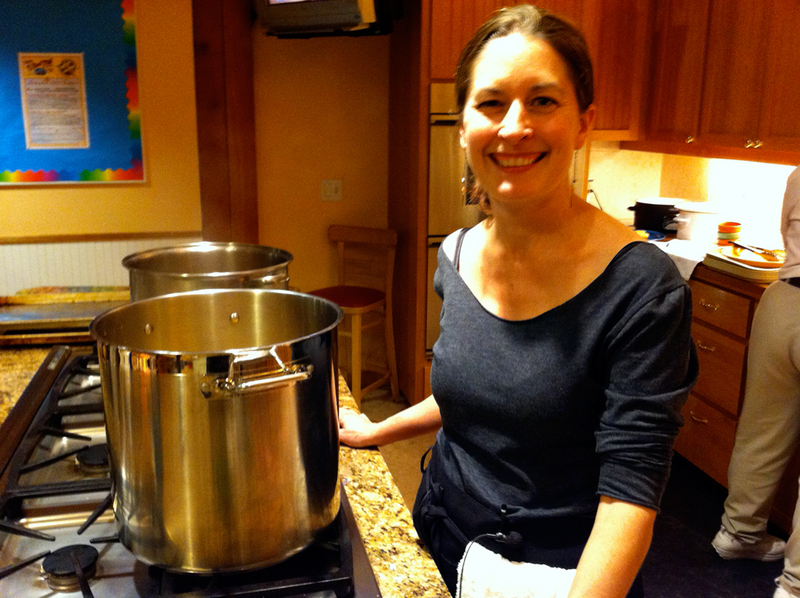 We thought that this was a fun and rewarding class and would encourage anyone out there who is interested in food or cooking to check out the classes at Bob’s Red Mill. Upcoming classes can be found listed here. Note that not all of their classes are gluten-free. This one wasn’t really billed as a gluten-free class, but everything in it was gluten-free. If you wanted to attend this class but missed it, we were told that this class and the desserts class taught by Kyra Bussanich will be repeating in February. You can reserve a spot now by calling Bonnie at Bob’s Red Mill 971-206-2208 (Mon-Fri 8:00 AM to 5:00 PM). Wow! This is going to be a full month. We just got this notice from Portobello Vegan Trattoria (our review here) that they’re having a gluten-free cooking class this weekend. This Sunday, we’re holding a gluten-free cooking class. It’s the fourth class in our series…we’ll show folks how to put together some treats to host a gluten-free vegan dinner party, then sit down together and enjoy our work with some wine, soft drinks, or gluten-free beer! 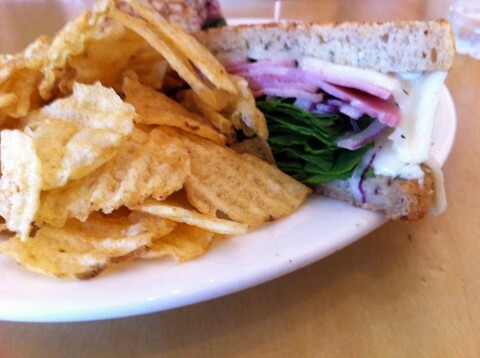 And on another note, we’ve added a lot of gluten-free items to our menu! Every night, there are SEVERAL appetizers, entrees, and even a couple of desserts that a gluten intolerant person can enjoy. Our friends started raving recently about a new gluten-free bakery that opened up on NE Alberta. We just went there for the first time two weekends ago, and went back for some pizza the night that they had their opening celebration. Tula Gluten Free Baking Co. is located at the corner of NE Martin Luther King Jr. and NE Alberta. 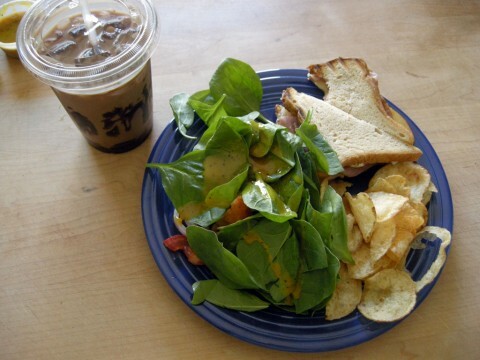 Besides being a bakery, they also have lunch and breakfast items, pizza, and espresso drinks. 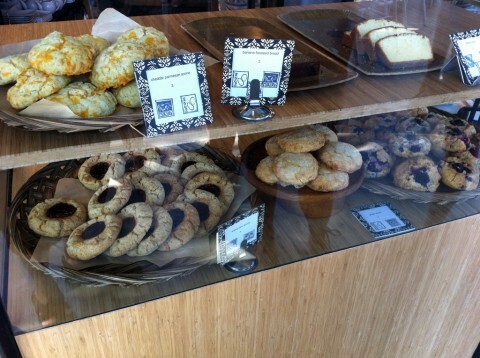 The bakery itself is good-sized, featuring a nice area to sit and eat gluten-free baked goods. Tula has a number of treats available. As mentioned above, they have pizza. Behind the counter they usually have a couple different kinds of scone, a few different tart-sized quiches, cookies, cupcakes, breads, and hand pies. You can also pick up some par-baked focaccia bread and/or delicious olive bread. Because baked goods are a particularly sore spot for the gluten-intolerant, we see it as our duty to eat lots and lots of baked goods. We do it out of our sense of duty and in a spirit of altruism. Especially when it comes to cookies. Here we have, starting at the cookie and moving clock-wise around the box: A chocolate-chip salt cookie, a mixed berry pie, a curried vegetable hand pie, and two mini quiches. The cookie ended up being the least popular item we sampled. None of us were particularly excited about it. It seems strangely greasy and besides the grease flavor, there isn’t a lot to it. We’re happy to report, however, that everything else here was really amazing. They all benefit from a little time in a toaster oven to get them warm again. We were especially fond of the berry pie, the curry hand pie, and the tomato dill mini quiche there. 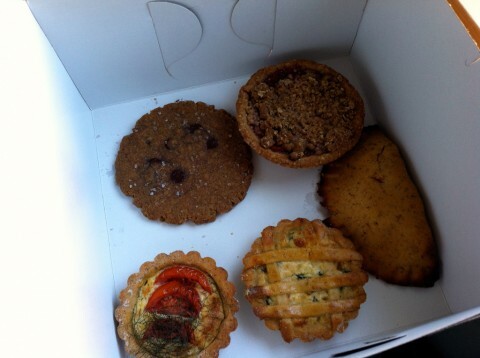 These all had great flavors, and the pie crust at Tula is really excellent. 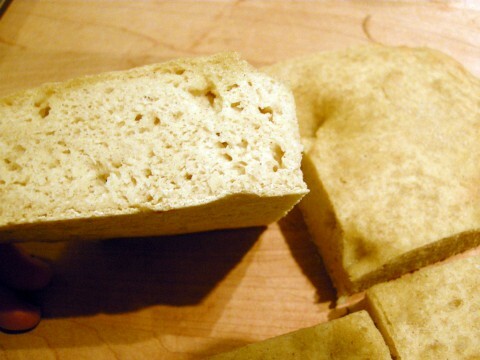 Focaccia bread is one of those things I really miss, and until now haven’t been able to replace it. The focaccia at Tula comes par baked. So you take it home and finish baking it right before you want to eat it. There’s enough focaccia there to make 4 good-sized sandwiches. The ingredients are millet flour, sorghum flour, potato starch, tapioca starch, agave syrup, xanthan gum, sea salt, olive oil, and rosemary (so it’s vegan). 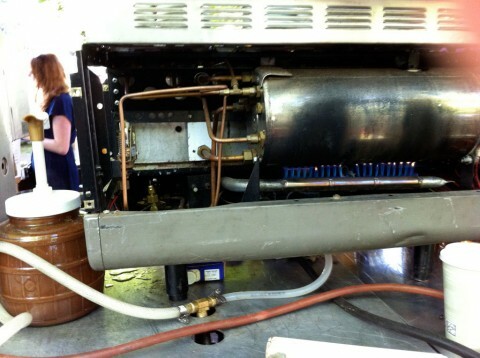 To finish baking, you put it in the oven at 375 degree and bake 11 to 15 minutes. Fresh out of the oven, this focaccia is soft, springy and delicious. It’s good dipped in oil and vinegar, but it’s even better with some honey! We also tried the pizza at Tula. The good news is that the pizza here is totally safe, since it’s made in a dedicated gluten-free bakery. 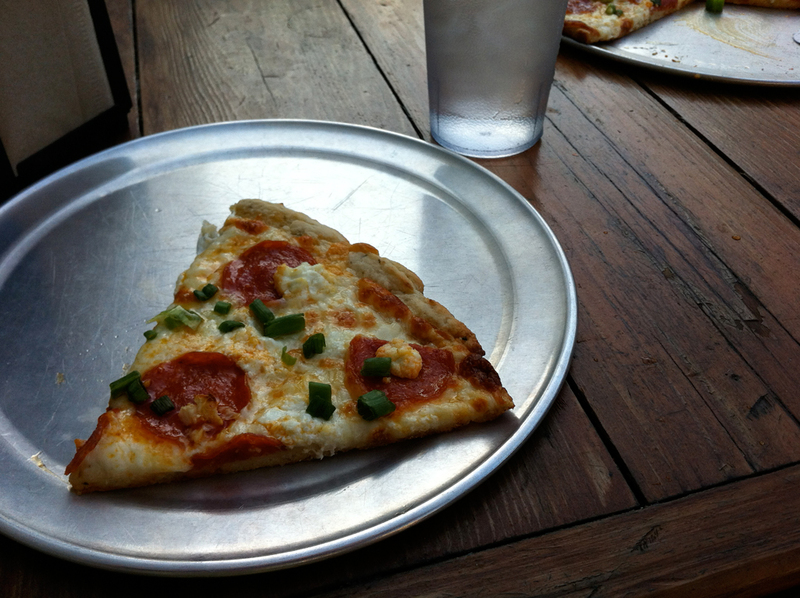 I’m used to crossing my fingers every time I set foot in a pizza place that has gluten-free pizza available. Half for good luck, and half because I feel like I’m testing my fate. Many places around town are careful about cross-contamination, but to me, it’s really nice to get a pizza that you know definitely hasn’t been dragged through a pile of wheat flour. The crust style is thin, and soft. 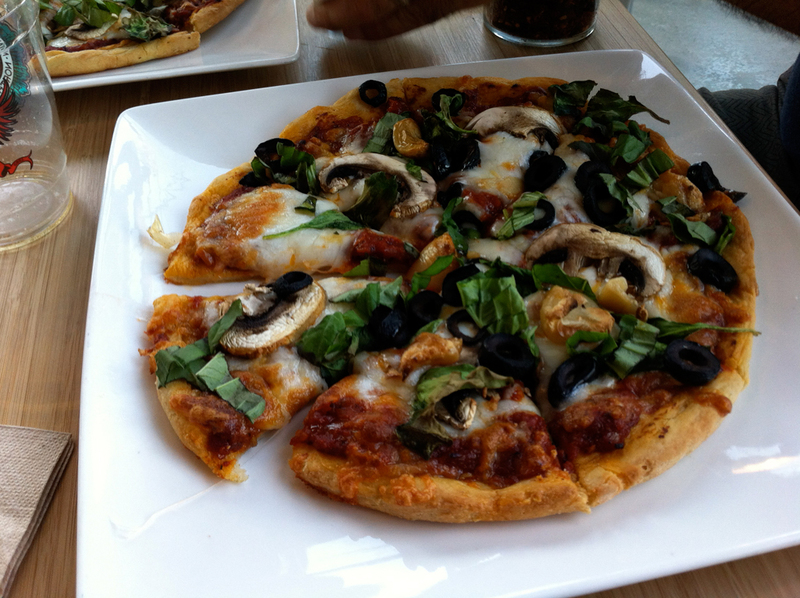 So if you’re into pizza with soft crusts, this one is for you. I found the lack of topping variety a little disappointing (they only have vegetarian options) and also Sienna and I were dissatisfied with the flavor. The sauce seems more like a ragu and is sweet. 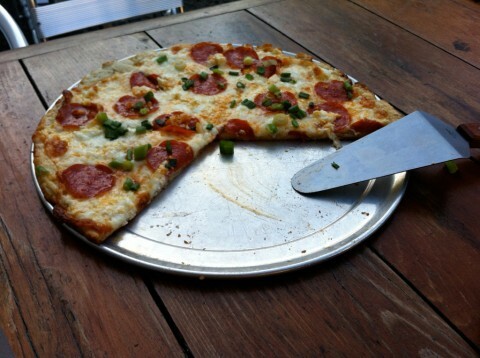 Although the cheese and other toppings are good, I felt like the sauce was seeping into the crust and losing its flavor. I think a lot of pizza places fight this by rubbing the crust with a crushed garlic piece and applying a bit of olive oil before adding the sauce. We’ve been back a couple of times, and every time we’ve had great experiences with the people at the counter. Everybody is friendly and ready to answer questions about the items there and the bakery itself. Did we mention that the place is vegetarian-friendly? They also have vegan options. Last, they serve sandwiches. Our final verdict: We’re really excited to have another retail gluten-free bakery open in town, and especially happy to have one that has such a wide range of products. We took the focaccia bread and made grilled cheese sandwiches out of it. This is my new favorite thing to do. 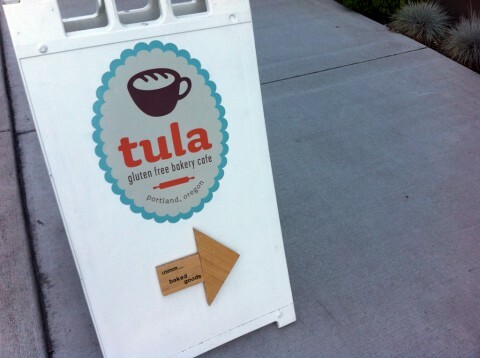 Tula Gluten Free Baking Co.
Editor’s note: We all went to Cafe Rio together, and our friend Lorna Nakell spontaneously wrote this review about our experience. (P.S. We try to mark when restaurants are vegan/vegetarian friendly, and this one very clearly is. Also, the espresso drinks that we had were awesome!) Thanks Lorna! 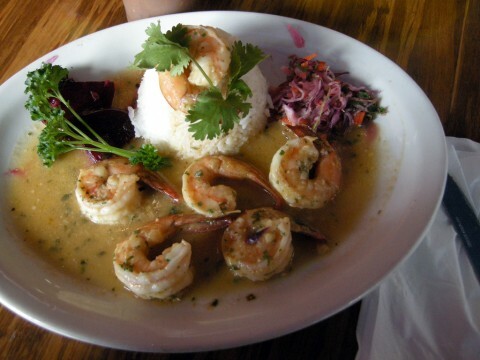 Café Rio is a hip enough sounding name for a Portland eatery—but don’t be deceived. Immediately upon entering this small establishment, friends and I were disappointed. It seemed that the owner couldn’t decide between having a sit-down or take-out restaurant, so they went for something in-between—not a cart, but also not a full dining establishment either—a “cartaurant.” Although there were five in our party, there was only one table—in the whole place (okay, it was actually two smaller tables that we had to fit together), and that table would only accommodate four of us. My son was left to make himself comfortable in an upholstered chair (complete with attached swivel table) that looked like it was teleported in from an 80’s style hotel lobby. The menu appeared simple enough for their small kitchen set-up and featured many variations of their specialty dish, GF waffles. 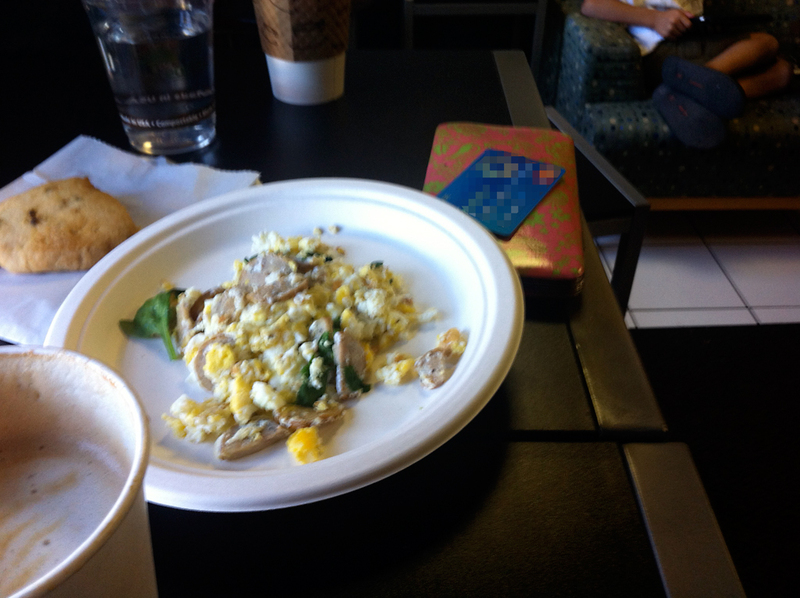 In addition, they offered scrambled eggs with your choice of toppings. At first we were afraid that they would be microwaving the eggs, but were pleased to find out that they actually had two small sauté pans at the ready. Dishes we ordered included two different egg scrambles, three different kinds of waffles, a scone (brought in from an outside baking co.), coffees and a fresh squeezed orange juice. This is what happened: Orders for our table came a little too staggered. We were surprised and saddened when our food was served on paper plates looking like it was prepared by my seven-year-old son (no offense, Calder). The egg dishes came without sides of toast or garnishes of any kind. Although the sausage in mine was tasty, the eggs were crumbly and they skimped on the spinach leaves. 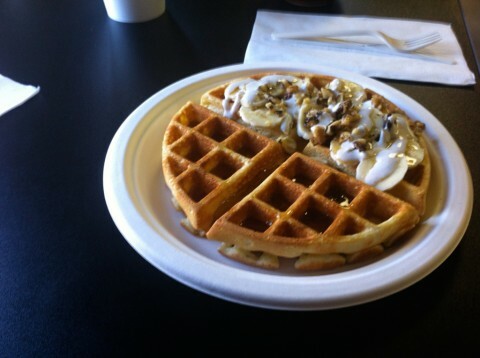 The waffles, on their own, ended up being pretty tasty and a good consistency. But, initially, we had a rough go at it because in addition to having to navigate waffle cutting with plastic utensils, we were informed that they didn’t have any butter or jam, but would we like some coconut oil instead (Ummm, why would I want that? Do YOU use that?). Bottom line: Friendly and accommodating service, airport style presentation and atmosphere. Although I want to be encouraging to any dining establishment that is trying to incorporate GF food into their menu, sometimes all the pieces of a restaurant just don’t fit together the way they should. So, in regards to Café Rio, I have to say that unless you live in their hood and are too tired from partying the night before to drag out ye ol’ waffle iron and whip up some Bob’s Redmill pancake mix (which, by the way, is what they use), by all means give them a try. If not, there are so many other great restaurants that serve GF goods these days, you shouldn’t go out of your way to visit Café Rio. Considering that their pizza graced the cover of the Portland Monthly Magazine in February of this year, I have an itching suspicion that we’re a little late to the party at Sizzle Pie. That doesn’t change the fact that their pizza is awesome. Sizzle Pie is smack dab in the hip blocks of East Burnside, at 624. It’s a couple blocks from the Doug Fir, and practically next door to that one cool bar with no name. Like the neighborhood, the decor, help, and jukebox is also hip. When we went there, the music ranged from The Cramps to a song that sounded like Devo if Devo was playing buzz guitars. The menu is adventurous/upscale. By “upscale” I don’t mean expensive. I mean there are ingredients like white truffle oil, goat cheese, cilantro pepitas pesto, and even dried cranberries. At Sizzle Pie, a person can get what might be called “gourmet pizza” if the term hadn’t already been ruined by marketers. Obviously, you can also get a basic pepperoni and mushroom slice if that’s what you’re looking for, but it’s nice to know there are lots of interesting options. All their crusts are vegan, including the gluten-free crust. They also have an enormous vegan section in their menu. As with most pizza places, alas, they cook the gluten-free pizza in a shared oven. So if you’re in the population who really need to watch out, then you should keep eating your pizza at New Cascadia or build your own with a store-bought crust. Speaking of pizza, the Sizzle Pie crust style is thin, and there are green specs in the crust, so obviously they’re adding in some spices to make it more flavorful. It’s delicious. Along with being thin, it’s also the perfect amount of crunchy. I don’t know how they did it, but this is among the best gluten-free crusts I’ve had. We got the Golden Ring pizza, which is White Truffle Oil, Goat Cheese, and Green Onion, and we added garlic and pepperoni. This was one awesome pizza. We got a 12 inch pizza and it was the perfect size to feed two. There are two things to note. First, the regular “large” pizza is 18 inches, but the gluten-free large is 16. Apparently the gluten-free crust just won’t get those extra couple of inches bigger. Second, don’t assume that the pizza you’re ordering is going to have red sauce. If you really want a pizza with red sauce, you should probably ask. There’s a place on the menu where it says that all their pizzas feature red sauce “unless otherwise noted” but this ends up being a little confusing, because if you get pesto, white truffle oil, caramelized onion spread, cream sauce, or something else that counts as “sauce” then you’re not getting red sauce. Which makes sense, but we got caught out. Luckily, our pizza was awesome without red sauce. Everybody we had contact with was very friendly, the pizza came out hot, and the place is nice and clean. We sat out back on the patio, which was great on a warm August night. There was a line when we walked in the door, and there was a line when we left. Our final verdict: With gluten-free pizza, we think that the crust is most of the battle, and so many crusts lack crunch or aren’t very flavorful. 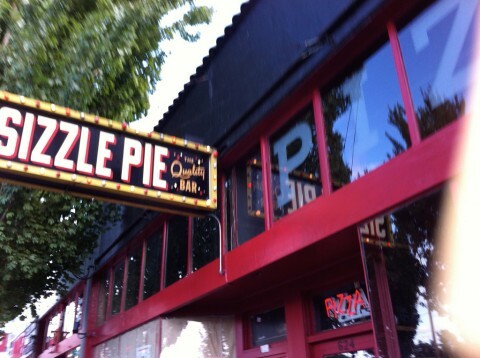 We’re going to have to try some more pies from Sizzle Pie, and it’s definitely not going to be a painful process, luckily! Have you eaten there yet? Let us know in the comments! Sometimes we find ourselves going back to places we reviewed months or years ago, and we’re often gratified to find that we were right the first time! Here’s a quick run-down on places we’ve been recently. Some new, most not. If you’re in the NE and want something good for lunch any day of the week, you should check out Seven Virtues on NE Glisan at 60th. They have great espresso drinks, delicious gluten-free and vegan goodies by Petunia’s (our review here), and gluten-free bread available for their sandwiches. I am especially partial to the Frazer Park sandwich, pictured above. They also make a mean iced mocha. We recently saw the documentary Food, Inc and decided to see what would happen if we started going to our local Farmer’s Markets. Besides fresh veggies, cheese, eggs, and flowers from local farms, there are a lot of local gluten-free businesses which sell their goods at your local farmer’s market. The PSU farmers market on Saturday morning is host to Petunia’s and New Cascadia Traditional Bakery (our info and review here). 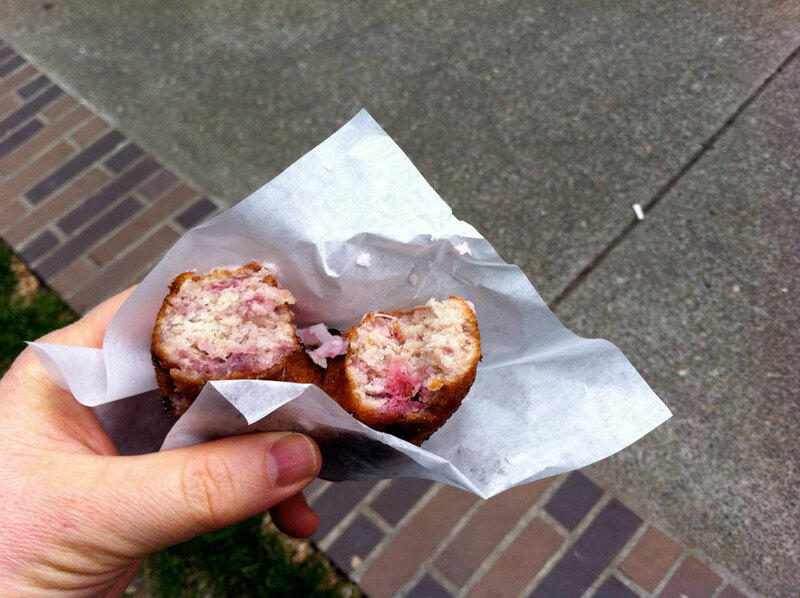 I saw Paobread (our review here) at the Montavilla Farmers Market the last time we went there. At the Buckman Farmers Market a person can pick up gluten-free hand pies made by Queen of Hearts (review coming soon). Although we haven’t gone yet, we’ve been told that Happy Camper Bread can be bought fresh at Hollywood Farmer’s Market. We’ve stopped by Chez Machin (our review here) on SE Hawthorne now and again. Although we wish their savory crepes had more options, they keep blowing our minds with their specials and their dessert crepes. We really recommend getting whatever the special entree of the day is, as long as it can be had gluten-free. Dessert Crepe at Suzette - Yow! 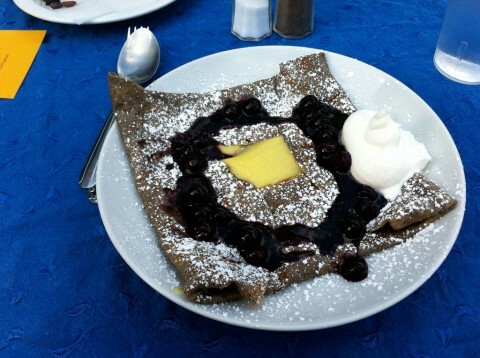 Speaking of crepes, we went to Suzette Creperie (our review) on NE Alberta for Bastille Day, dined on delicious crepes, and listened to AnnaPaul and the Bearded Lady. 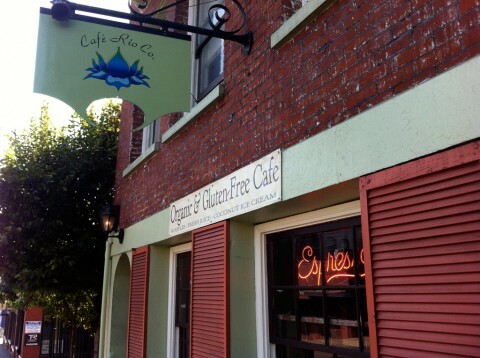 A recent Groupon or Living Social deal informed us that the Blackwood Cafe on NE 70th has gluten-free bread available. I went there by myself recently and got their special of the day, which was an intriguing sandwich with gruyere cheese, apple slices, and (if my memory serves) Prosciutto. The sandwich was really good, but the bread was like Udi’s, which isn’t really my favorite. The iced mocha was really chocolatey. They have a fun menu, but their atmosphere is kind of uncomfortable for some reason. Things we expected to be better from the Farmers Markets: tomatoes. Things we might not have: celery, cherries, cucumbers, cheeses, and sausages. Celery? We found thin, kind of sickly-looking celery at the Montavilla Market recently and what a surprise! It’s got a surprising, delightful flavor. Almost herbal or floral. Mmmmm. At the PSU Market look for my favorite cucumber of all time – the lemon cucumber. Also at the PSU Market, we found Rogue Creamery’s Raw Milk Sharp Cheddar Cheese and wow is it amazing, especially with a little of your favorite jam. Finally, we’ve tried some items from Olympic Provisions and have yet to be disappointed. Thanks to everyone who emailed us about Subway stores getting gluten-free bread and brownies. We kind of ignored the news because we’re more into supporting our local businesses. We do really appreciate it when people email us, even though sometimes it can take a long time for us to get back to them. Got any recommendations for shopping at the Farmers Markets? We’re still really new at it and learning. Let us know in the comments! We’ve been meaning to review Petunia’s Pies for months now. Literally for months. So a couple of weeks ago we got up early on a Saturday morning and drove over to the PSU Farmers Market, where Petunia’s has a stand. 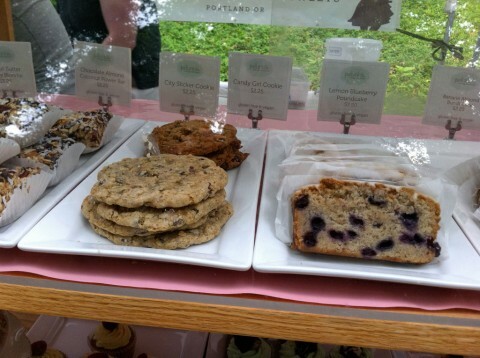 It also bears mentioning that Petunia’s goodies can be found at Whole Foods markets, Blossoming Lotus, Cloud Seven Cafe, Ruby Jewel Scoop Shop, Spoke Coffee, Mississippi Pizza (our review here) & Seven Virtues Coffee (who we mentioned recently). Here is the start of a fine Saturday morning. 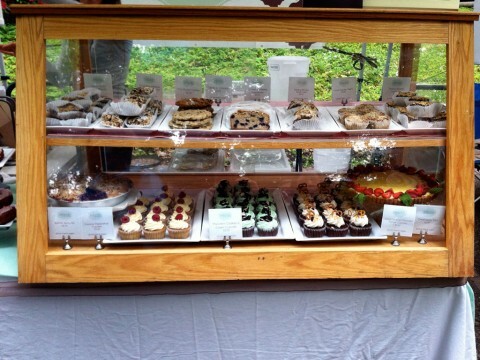 Compared to New Cascadia’s cart, which is a stone’s throw down the sidewalk, Petunia’s is more about the sweet goodies. 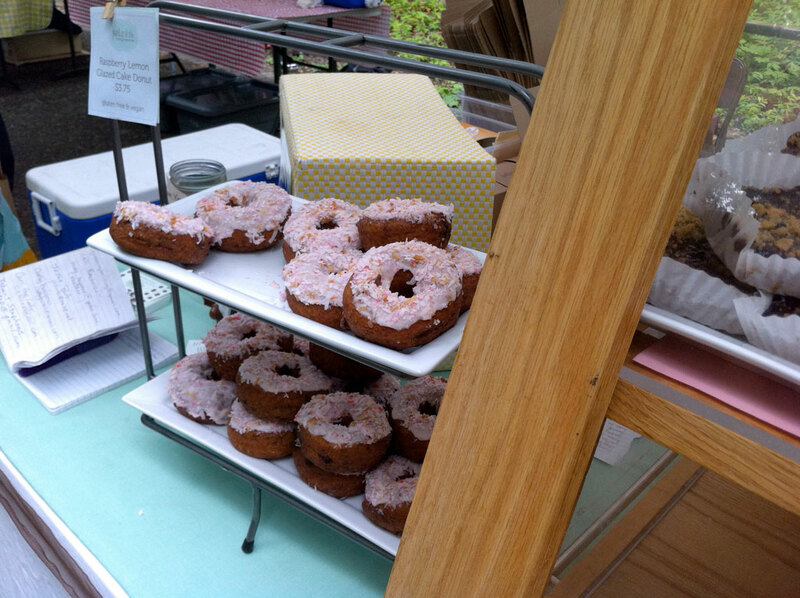 In the case this morning were brownies, muffins, cookies, pound cake, bundt cake, pie, cupcakes, cakes, and donuts. Candy Girl Cookie – This is sort of like a fortified chocolate chip cookie. It has other various items in it, the most noticeable of which is raisins. I really like these cookies. They are crunchy/chewy in the right places. The added adult cookie ingredients supply extra interest. 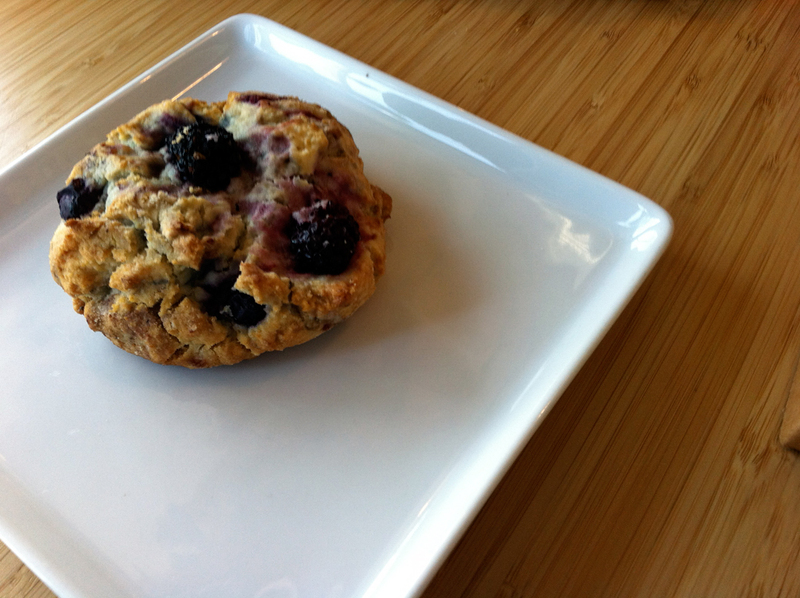 In fact, as of now, Petunia’s has my vote for the best gluten-free cookie in Portland. Lemon Blueberry Poundcake – Because of the density and texture, it’s more like a slice of muffin with some glaze on top than pound cake. I really like the flavors, though. Chocolate Almond Coconut Power Bar – This is something like a rice crispy bar with chocolate, dried cranberries, almonds, and coconut. This item was not our favorite, but I don’t think that we’re really the intended audience. So if you’re a fan of this sort of treat, don’t listen to anything I have to say about it. Bumble Berry Pie – We both loved this pie. The pie had the exact right everything: flavor, texture, crumb, crust, sour, sweet. Delicious! Awesome! Amazing. Carrot Zucchini Muffin – Will you look at this muffin? Looks good, huh? 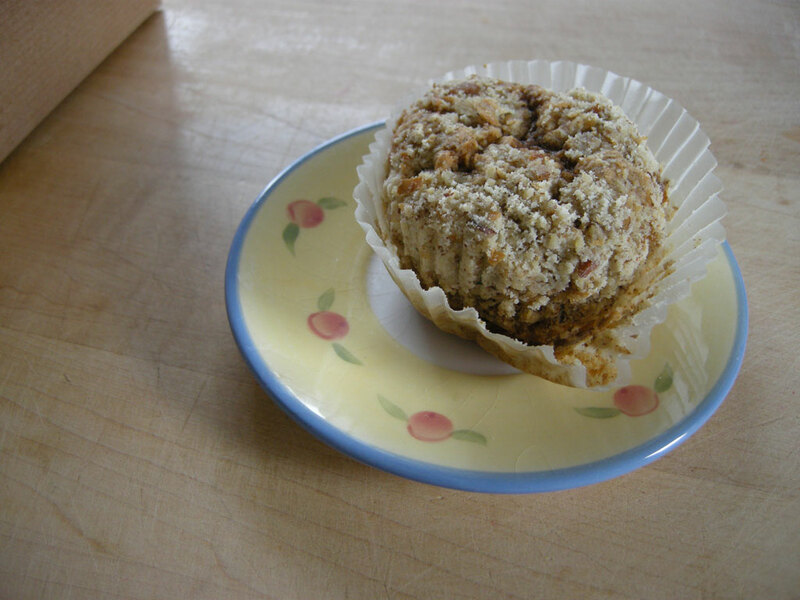 This muffin was like a love letter to muffins. It was delicious. Besides the pie, this was our favorite item from Petunia’s. It was light, airy, crumbly, and not too sweet. I’m kind of a fan of zucchini muffins, and this was easily the best one I’ve had in years. I forgot to mention that the people at the stand were all really friendly and helpful, on both times we visited. Besides the difficultly of preparing good baked goods without gluten, Petunia’s also delivers them without animal products. I’m really hoping that they follow the lead of New Cascadia Traditional Bakery and Crave Bake Shop and open a retail operation somewhere. Maybe in the NorthEast, within walking distance from our house? 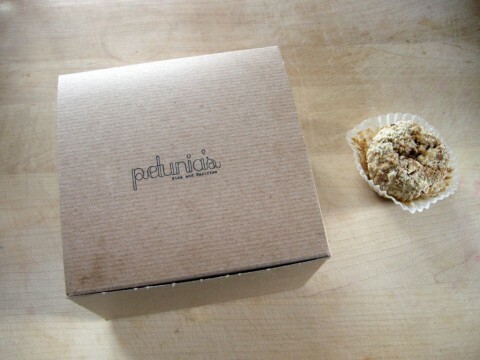 We want to know: Have you had any of Petunia’s other pies? Any other favorite stands at the Farmers Market? Let us know in the comments.